Providing early warning of potential future network failure/crisis. Establish a foundation and direction for accurate planning which adequately supports future business and technology initiatives. Accurately uncover your network topology including all hardware, software and hidden procedures. Provides you with essential facts for making appropriate technical and executive decisions involving your technology. A TEKEASE Network Assessment provides small business enterprises with operational, tactical, and strategic reviews of their current network environment. Using TEKEASE tools and our structured Lifecycle Methodology we will help to define identifiable critical business and end-user requirements; gather essential network metrics and statistics; map the network topology; and provide your organization with detailed and comprehensive assessment report. A network assessment is an essential tool in helping you to maintain a healthy network and computing environment. Our report will provide accurate information which will enable you to make informed decisions about future implementation of new technologies. The assessment helps the client to avoid unforeseen surprises by providing early warning to hidden problems. Clients can use the assessment report and consultation with TEKEASE consultants to develop appropriate contingency plans for network weaknesses and vulnerabilities. All companies should have a network assessment performed on an annual basis or more frequently if warranted. Some organizations like those subject to HIPPA and PCI compliance should engage an appropriate managed services provider like TEKEASE to provide ongoing network monitoring and assessment to help them remain compliant. Upon engagement a TEKEASE consultant will provide a detailed Scope of Work which outlines all procedures, methodology and deliverables. 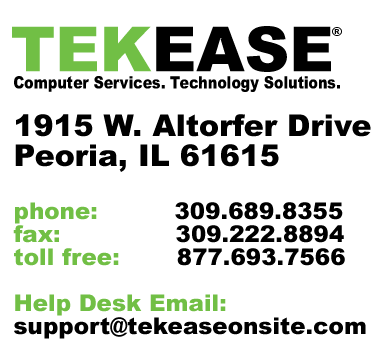 To schedule a TEKEASE network assessment contact us at 309.689.8355.